Make the Most of Microsoft Applications—Attend Our Dec 10 Webinar! Excel ConsultantBlogBlog CategoryMake the Most of Microsoft Applications—Attend Our FREE Dec 10 Webinar! Click Here to Attend This Free Webinar being held December 10th, at 12-1pm pst. At Excel Consultant, our team of programmers, advisers, and educators enjoys helping clients succeed with the technological tools at their disposal. As Microsoft specialists, we understand the ins and outs of the entire Office Suite’s versatile applications and more. We are passionate about helping businesses, organizations, and institutions with particular projects, but we also take every opportunity to provide free assistance so our community can thrive. That’s why we’re delighted to announce that we’ll be providing our second webinar with the Irvine Chamber of Commerce next week on Thursday, December 10 at noon. This online seminar will cover successful strategies for using two or more Microsoft applications without the complexity of coding. Read on to learn more about what this webinar will cover and find out how you can attend. As part of its initiative to enhance the local economy and help companies succeed, the Irvine Chamber of Commerce created Irvine Build Businesses, a series of free webinars it hosts every week. These events provide interactive educational opportunities for interested business owners, entrepreneurs, and individuals in Irvine and beyond. To offer valuable information for these people, the Chamber of Commerce seeks the assistance of experts in their industries, who share their skills with participants. The Excel Consultant team provided our first webinar for Irvine Builds Businesses last month on November 5. If you missed it, you can check out a recording of it here. We are proud to partner with the Chamber of Commerce to help boost local businesses and empower employees. The title of this webinar is “Power Tips for Microsoft Office.” You’re probably fairly familiar with each Microsoft application in the Office Suite—you can write documents in Word, calculate spreadsheets in Excel, make presentations in PowerPoint—but you may not know how to combine programs to unlock their full potential. At Excel Consultant, we’ve found that learning how to integrate applications is a simple but important ability that can be quite beneficial in a business setting. For more advanced cross-functionality, you may need to dig into the code of the programs, but we can show you how to do a lot without even using VBA (Visual Basic for Applications, one of the more basic programming languages in Microsoft). With the click of a few buttons in the existing interfaces of your favorite Microsoft applications, we can show you how to transform your workflow. For example, we can help you send large tables from Excel to Access (Microsoft’s database management system), email through Outlook from Excel, or place an Excel chart in a PowerPoint presentation. We’ll begin by teaching you the most common (and useful) keyboard shortcuts, so you no longer have to click or find the right tab to complete everyday operations. Next, we’ll show you how to send emails from Office applications using filing and sharing. This can make office and client communications much simpler and more streamlined. Furthermore, we’ll instruct you to how automatically share data between Office applications, linking from Word to Excel, Excel to Word, PowerPoint to Excel, and Excel to PowerPoint. We’ll explain how to get data from Word or Excel to Access and use Word mail merge from Excel or Access. During the webinar, we’ll also demonstrate how to import and export tables and other formatted content between applications, using copy/paste, special values, source formatting, and destination formatting. These functions will make analyzing your numbers, creating promotional materials, communicating with coworkers, and more a lot easier. Finally, we’ll discuss how you can leverage the power of the Cloud to collaborate and increase efficiency in your office. We’ll discuss the Personal and Business versions of Microsoft OneDrive. 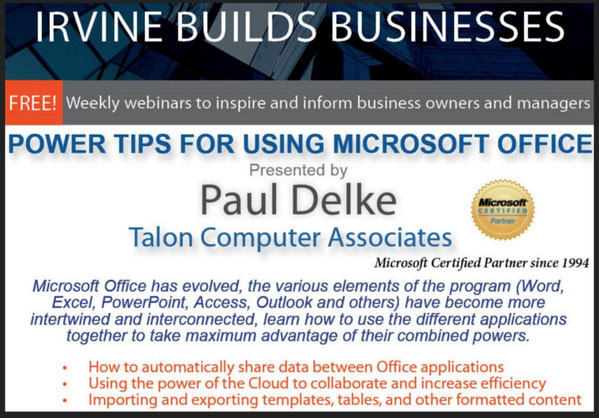 As with our last webinar, “Use Excel Like a Pro and Master Your Data,” your Microsoft master will be Paul Delke. He is the Senior Project Manager and Programmer at Excel Consultant and the President of Talon Corp, a fellow firm and esteemed Microsoft Certified Partner since 1994. Paul has spent the past 30 years helping clients utilize Microsoft programs to their full potential, so he understands what companies need to know about these advantageous applications. Do You Want to Attend This Webinar? Paul will be presenting this webinar to the Irvine Chamber of Commerce and its members, but it is also open to anyone who wishes to attend. Any person or company can watch, listen, ask questions, and learn online. No matter what type of venture you have or where you’re located, you can benefit from his advice and expertise. All you’ll need is a computer with the ability to download and run Fuze, an advanced webinar platform. Once you’ve got your system set up, all you’ll have to do is log in at or before noon on December 10. Paul will most likely lecture for approximately 45 minutes before answering any questions attendees have. As with our first webinar, you will be able to view a recording of this event on YouTube after it occurs. Would you like to learn more about our upcoming webinar? Are you curious about other computer tips? Do you need consulting assistance with a major Microsoft undertaking at your office? Contact Excel Consultant today to learn more about our services or schedule an appointment with a member of our team. Posted on December 4, 2015 Posted in Blog Category and tagged Database, Tips, Client, Power, Learn.